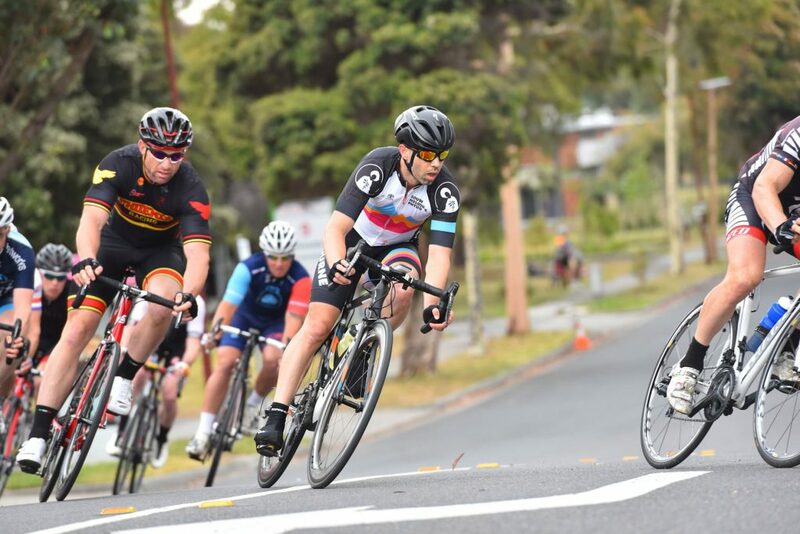 In this article I will outline my own personal experiences racing criteriums in Melbourne’s high-profile race scene. 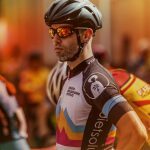 I will share insights and tips that I have learned along the way – particularly since making the BIG jump from B grade to A grade – and the reasons why all aspiring racers should want to make the grade. But before I share my lessons, let me paint a little picture for you. You know it. You FEEL it… Coming into another race weekend on the crest of a wave of confidence following successive podiums. The force is with you today and you know it. Arriving at the circuit and going through the routine of registration, bike prep, and number pinning, you’re already feeling light on your feet. Through a succession of discreet but distinct sideways glances, your competitors know it too – “he is here”, they think. 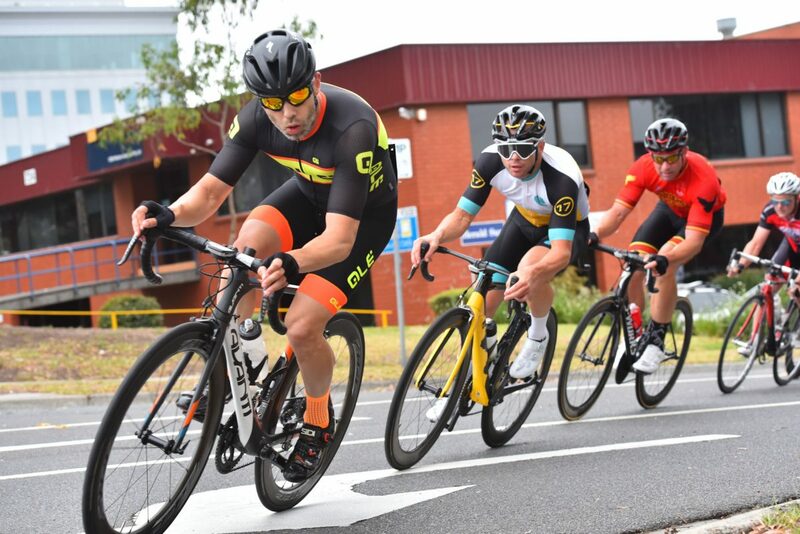 In late November 2015, I found myself in the enviable position of athlete flow – a blend of form and great results after 3 B-grade podiums in 4 races, at the most challenging of circuits – the NRS rider favourite, Glenvale Crescent (Caulfield Carnegie Cycling Club). Surely, this was the day of my flying sprint victory. But you can still do everything right and finish 2nd – overpowering via over-excitement on exit of turn four, my front wheel rose and a tank slapper was had. But even then, I had the torque to pass five wheels before the finish line for a 2nd placing that day. This was it, I had been given the nod as one of the top racers and earned my place in the A Grade field. You ripper!! I had only discovered cycling at 30 and had done five competitive seasons until that point, climbing through the grades at Coburg, Hawthorn and Carnegie cycling clubs with the occasional delve at St Kilda. I must be doing something right? But flow can be fleeting and confidence can be a cruel friend who only hangs around for the good times. As a B grader who earned most podiums via sprinting, the pace of A grade was a shock. Nath’s data from a B grade criterium podium. Nath’s data from his first A grade criterium. Note the average will be slightly lower than the actual race as you’ll see the timing goes a little beyond the race finish. The hour of A grade pain commonly distracts riders from hitting stop on their bike board computers at the right time! Either way, you can see the heart rate redlining for almost a full hour and a big increase across the board. I managed to get through my first race, holding the wheels of a one Tommy Nankervis on occasion, but ‘first ride adrenaline’ has a habit of ill-defined expectations. My next few races ended in failure, barely able to make it beyond the 20 minute mark on one occasion – talk about coming back down to earth! The pace somehow never dropped, gaps formed in front of my wheel out of nowhere and my heartrate never made it out of Z4 while I frantically spun my legs at 120 RPM in an effort to keep up. The jump to A grade made me feel like I was lining up for my first ever race again. This felt embarrassing, it almost wasn’t worth turning up. My rivals weren’t fearing my finishing speed now – they were fearing I’d create gaps for them to bridge! Nathan’s A grade criterium heart rate on debut. It was time to look inside myself and polish the aspects of my game if was to come up to A grade pace. Now in my third season of A grade, I’m by no means a sure thing each weekend but I can say I’m now on terms with the bunch and proud to be able to say that I race A grade, not just barely survive. The fitness for A grade isn’t making efforts per se – it’s having the ability to resist any temptation there might be for a quick rest during a long effort. If you take your foot of the gas momentarily, you can be spat out the back before you know it. It’s literally on all the time. If you’re a climber or TT specialist, this might come naturally. In B grade there’s only a few guys who are willing to hurt and put in the work – the gaps will close themselves as long as you keep pedalling… There’s no such thing in A grade, EVERYONE can pull and EVERYONE can sprint! There’s no second chances if you can’t hold the wheel – think of being the in B grade break from the first minute. I had to build up my lactic resistance, so I would train 5 x 5 minute FTP efforts on the indoor trainer with just one minute rest. This was self-prescribed to hold those wheels during those extended racing efforts. I’d also include two torturous 12 minute Over/Under efforts to finish off the training hour. The key to a good finish are those sessions that still keep the power going late in the piece and I can’t recommend Zwift racing enough for that exact purpose. With the danger element eliminated, Zwift racing allows full-gas racing for a complete 60 minutes rather than the 35 minutes on offer at my local Wednesday night race – vital for putting that urgent late race strain into your legs that training generally cannot. Intimidation is a real thing in A Grade – all the sudden there are guys in matching team kits, NRS riders in their perfectly fitting outfits and even (gulp) a few Euro pro’s visiting home around the Christmas period. 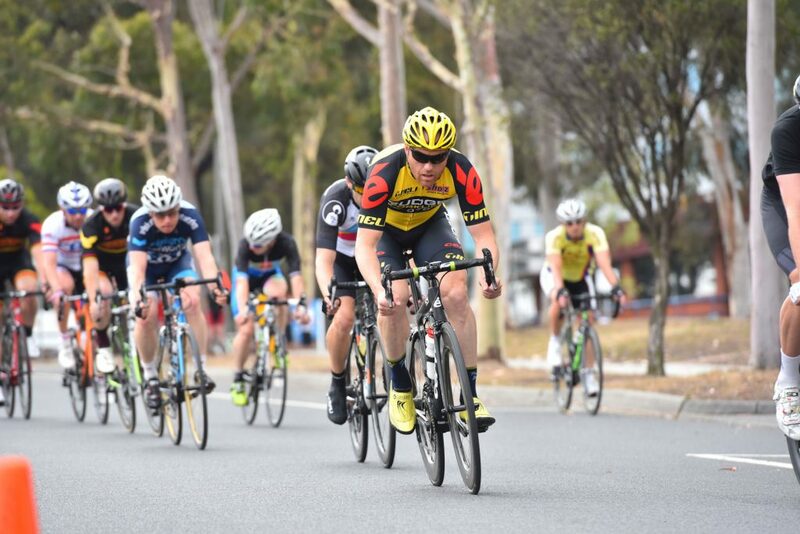 Here’s Nathan in his first A grade criterium following the wheel of Tommy Nankervis – the man who used to ride professionally overseas. Tommy was riding for National Road Series team Budget Forklifts at the time of this photo, and last year won 25 A grade criteriums in one season. That’s some intimidation factor right there. Studies have shown that mental approach can be responsible for physical performance increase simply by having confident body language. So get your start routine sorted and make sure it’s yours, not a copy of someone else’s. Cornering in A Grade is a much different proposition from the lower grades as there’s a more urgent need to keep your average speed up leading into, and exiting, each corner. Your senses need to be on high alert, holding that wheel in front of you all the way. You’ll especially be requiring some extra gas upon corner exits so there’s no dropping front wheels a bike length or two and derailing any strategy you had pre-race to conserve energy as much as possible! There’s a lot out there on proper cornering, but for me it was a case of watching what everyone else did – coast before the corner, not through it (except to avoid a touchdown). This is Nathan is his first A grade criterium at Melbourne’s Glenvale. A tough course. This is the third corner. As Nathan discusses, you’d much rather be sucking that wheel in front of you than sitting a bike length back. All it means is more chasing and burning energy on the straights. This will hurt you big time in A grade. Give the pedals a 2-3 revolutions prior to corner entry and I mean about 300 watt tinker, not a little tap. The average speed around the treacherous turn two at Glenvale is often 50 km/h+ so you don’t want to lose that wheel… Get down low for the corner and gas it immediately on exit – you want to have the shortest time possible that you’re not pedalling. Make sure to not look directly at the wheel in front of you, where you could be more reactive and jittery on corner entry. Be sure to look 2-3 wheels in front of you so you know what’s coming and your mind and limbs will adapt more easily, leading to better balance. In my early A Grade races I found my cadence was all over the place, ranging from 90-120 RPM and sending my heart rate spiking – enough repeats of that and it was time for an early shower and another week of soul searching for motivation. To combat this error, I placed an audible warning on my Garmin to let me know when my cadence was 110 RPM, similar to an ‘up shift’ warning light you might find on a racing car. It worked a treat – the balance between cadence and pedal force had been found and the results are there to see in my race data. I’m proud to call myself an A grade crit racer. It’s been a long road to get there and I still might not finish every single race on the last lap, but I can honestly say that at 38 years old, I have the privilege of still being a competitive athlete fighting for a race finish against semi-professionals, ex national champs and current professionals, which brings me more satisfaction than a podium finish did in my early days. Heck, now I can even tell my kids that Daddy once raced against the American national road champion, Larry Warbasse. It’s a different league, it’s a different level, but it’s a worthy goal of any club racer and it deserves your best shot. Thanks for sharing this info. Really liked the stats on B grade to A grade jump. That was a great read, given me lots to think about. THanks for sharing your insights and learnings Nathan.